President Donald Trump always shines when the klieg lights are the brightest. 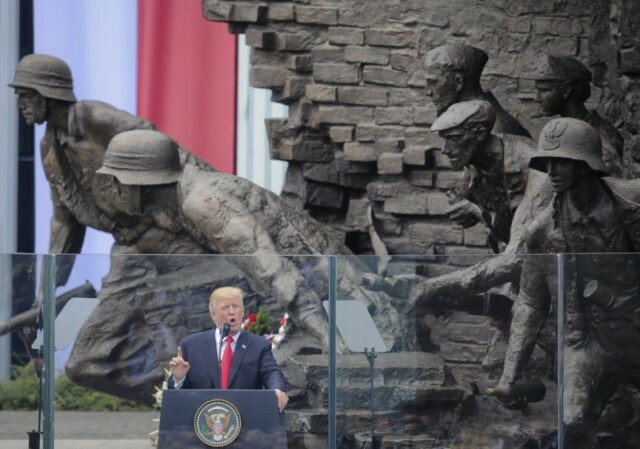 On Thursday, Trump went to Poland and delivered a landmark speech in front of the Warsaw Uprising Monument in which he forcefully defended Western civilization and the values that bind its nation-states.
.@krauthammer has completely mis-read Trump's Warsaw speech. It's not a refutation of "America first," but an extrapolation on global scale. Here are the top 9 highlights. Poland is a land of great heroes. And you are a people who know the true value of what you defend. For Americans, Poland has been a symbol of hope since the beginning of our nation. Polish heroes and American patriots fought side by side in our War of Independence and in many wars that followed. [As] the Polish experience reminds us, the defense of the West ultimately rests not only on means but also on the will of its people to prevail and be successful and get what you have to have. But just as our adversaries and enemies of the past learned here in Poland, we know that these forces, too, are doomed to fail if we want them to fail. And we do, indeed, want them to fail. They are doomed not only because our alliance is strong, our countries are resilient, and our power is unmatched. Through all of that, you have to say everything is true. Our adversaries, however, are doomed because we will never forget who we are. And if we don’t forget who are, we just can’t be beaten. Americans will never forget. The nations of Europe will never forget. We are the fastest and the greatest community. There is nothing like our community of nations. The world has never known anything like our community of nations. And above all, we value the dignity of every human life, protect the rights of every person, and share the hope of every soul to live in freedom. That is who we are. Those are the priceless ties that bind us together as nations, as allies, and as a civilization. What we have, what we inherited from our — and you know this better than anybody, and you see it today with this incredible group of people — what we’ve inherited from our ancestors has never existed to this extent before. And if we fail to preserve it, it will never, ever exist again. So we cannot fail. That is also why we salute the Polish people for being one of the NATO countries that has actually achieved the benchmark for investment in our common defense. During a historic gathering in Saudi Arabia, I called on the leaders of more than 50 Muslim nations to join together to drive out this menace which threatens all of humanity. We must stand united against these shared enemies to strip them of their territory and their funding, and their networks, and any form of ideological support that they may have. We are fighting hard against radical Islamic terrorism, and we will prevail. We cannot accept those who reject our values and who use hatred to justify violence against innocent. And when the day came on June 2nd, 1979, and one million Poles gathered around Victory Square for their very first mass with their Polish Pope, that day, every communist in Warsaw must have known that their oppressive system would soon come crashing down. The memories of those who perished in the Warsaw Uprising cry out across the decades, and few are clearer than the memories of those who died to build and defend the Jerusalem Avenue crossing. Those heroes remind us that the West was saved with the blood of patriots; that each generation must rise up and play their part in its defense… and that every foot of ground, and every last inch of civilization, is worth defending with your life. Trump’s forceful defense of western values silenced some of his harshest critics. The Weekly Standard’s Bill Kristol, who has been repeatedly calling for Trump’s resignation, had to begrudgingly give credit where credit was due. Trump hater Nicolle Wallace conceded on MSNBC that Trump used forceful language against the Russians and those who may threaten the West. CNN had to concede that Trump’s speech was “eloquent,” “well-delivered,” “and one of the best speeches of his presidency.” Other reporters in the legacy media seemed to have trouble coming up with attack lines that would not make them look any more ridiculous than they have been while covering Trump.